So, after many weeks of setting up the board, this episode felt like progress. At least in terms of plot progression. In terms of character? I just don’t know you guys. In Arendelle of the past we meet the three royal sisters, Ingrid (the Snow Queen), Helga (the Emma lookalike), and Gerda (Elsa’s and Anna’s mother). Strangely the show tries to sell us two stories about their relationship simultaneously. We’re told they are super close, best friends as well as sisters, and that their bond is literal magic. But the first thing they do is bicker, Ingrid comes off entitled as much as cursed and Gerda is a different kind of monster. Helga, who has a lot in common with Anna and as previously mentioned is supposed to resemble Emma, comes off the best as she consistently tries to include, comfort, and support her sister. She also ends up dead, and it’s probably the best fate of the three. But I’m jumping ahead. The sisters find a kite, fly it, crash it, and argue over who gets to keep the pretty yellow ribbon that makes up its tail. As Ingrid is claiming she should get it because she’s the heir a smarmy man appears and tries to abduct them. Ingrid’s emotions manifest as snow powers and knock a tree on top of him. The sisters make a pact to keep it all a secret and share the kite tail ribbon, tying a third onto each of their wrists. As they grow up, Ingrid becomes more and more isolated. Helga tries to convince her to join the living, but she’s afraid, and when she does creep outside of her safety zone snow starts to fall, reinforcing that she can’t control it. So Gerda suggests they hop over to Misthaven to talk to Rumplestiltskin about getting rid of her powers. Where does Gerda get her intel? Why is Rumplestilskin the only wizard anyone ever goes to? Why does Gerda later go to the rock trolls instead of Rumpletstiltskin? Why didn’t they go to the rock trolls in the first place? Because reasons, I guess. Anyway Rumple thinks it’s stupid to give up so much power and even offers to train her but Ingrid just wants to conceal and not feel. 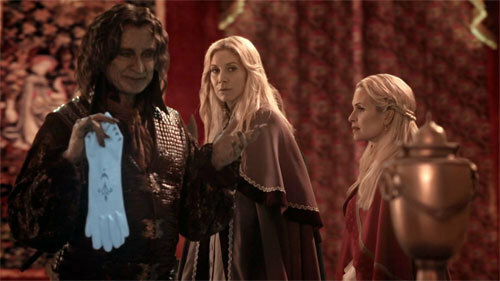 Rumple gives her allegedly magic gloves that will do just that, as long as she believes it, and a “failsafe” urn that will steal all her power should that become necessary. In exchange he wants the three yellow ribbons. Helga and Gerda think that is too high a price, but Ingrid agrees, and her sisters go along since she’s the one with the magical problem. Feeling safe now that she has the gloves, Ingrid dresses up in her snow queen regalia to hang out in the royal gazebo. This makes no sense contextually (no one will suspect I am a snow enchantress if I dress like a snow enchantress for exactly no reason, it seems to be spring?) or in terms of character (the very best way to hide your ice and snow powers is to dress up like a snowflake) but it’s her character design so whatever. 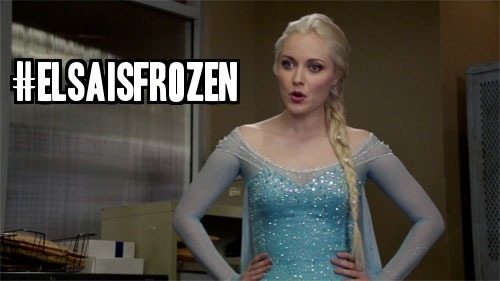 Related: will Elsa EVER change clothes? Duke Weaseltown, presented earlier as Helga’s intended, shows up and sexually assaults Ingrid. Explicitly. He tells her outright he’s after the crown and then tries to kiss her despite her saying No, no, no, and physically retreating. Next thing we know he’s been blasted by snow and she’s begging him not to tell anyone. So that’s another great message about romance in this series (no). Helga appears and Weasel tells her Ingrid made a play for him that he, of course, rebuffed but Helga knows her sister would never and breaks up with him. So he resorts to blackmail, he gets to be king or he tells everyone about the monster queen. Ingrid freaks out and blasts him again but Helga gets in the way. The blast hits her heart, she turns to ice and crumbles. Ingrid’s powers and/or emotions must be stronger than Elsa’s as it took Anna at least a day to turn completely. Weasel runs off and Gerda runs on to find her scary, superior sister has accidentally murdered her kind, heroic sister and decides to trap Ingrid in the urn. Then she treks over to the trolls to convince Grandpappy to make everyone within the power sphere of Arendelle forget that Ingrid and Helga ever existed. This whole thing would explain why Gerda is so very afraid of Elsa’s powers except Gerda also forgets everything. Thus Ingrid decides the only people she can trust are people exactly like her. 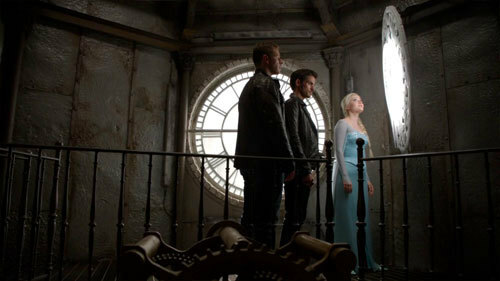 Forward in Storybrooke, Snow is playing the part of Gerda in the present story which makes very limited sense since until now the whole point of Snow is that she has hope (the opposite of fear) for everyone. First, Emma has plans to babysit her brother and she shows up as Mommy and Me Class is ending. Ashley leads the class because having a baby either six months or two years longer than the rest of them (baby Alexandra looks barely older than baby Neal and baby Phillip even though by rights she should be a toddler by now but time works in mysterious ways in Storybrooke) makes her qualified. 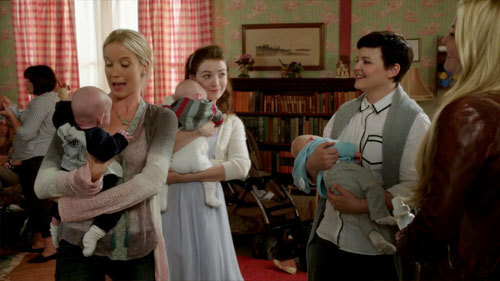 Emma starts to feel sad that Neal is Snow’s first baby for all intents and purposes and it makes his milk boil which in turn makes Snow reluctant to hand over her baby. Now, the show has made a point of making Snow overprotective of baby Neal, and given her past that is entirely reasonable. So this hesitation is not damning but it does help Ingrid’s case when Emma is defending her family just minutes later. Ingrid sets up a trap to make it look like the Sheriff’s department are not wholly incompetent but we know the truth. Interrogating Ingrid is too much for Elsa (why would Elsa be included in the first place?) so Emma sends her away and Ingrid starts to work her own brand of manipulation. It’s actually surprising Ingrid was NOT a disciple of Rumple since she uses all the same tactics of telling just enough of the truth to catch Emma up in her own drama. Ingrid reminds Emma that her parents chose their kingdom over their daughter and abandoned her to this strange, cruel world. That she grew up all alone and whatever lies they’ve sold her, she is still alone. Her family will never understand her, that deep down they fear her power. And because continuity is transient on this series a) her family enact all this on cue and b) Emma forgets that like two days ago she told Regina the same thing ending with you are the only one who really gets it. No but really, why is Regina not a part of this? She wanted to interrogate the Snow Queen two episodes ago and she was on Team Sheriff last week but this week she is back in her vault and drama and…why? 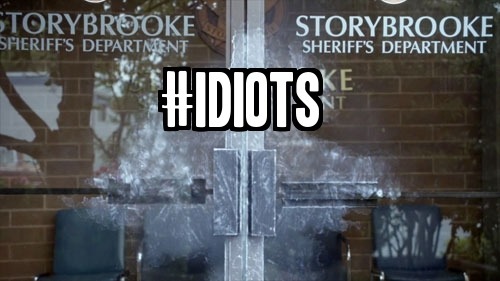 Meanwhile, the brain trust figure out that Ingrid meant to be caught and rush back only to find the doors iced over and Emma trapped inside. Instead of Elsa trying to counteract it with her own ice or asking Regina, whose favourite spell involves flinging fire at things (I have no idea why that would be useful against a frozen door), they head over to Rumple’s. 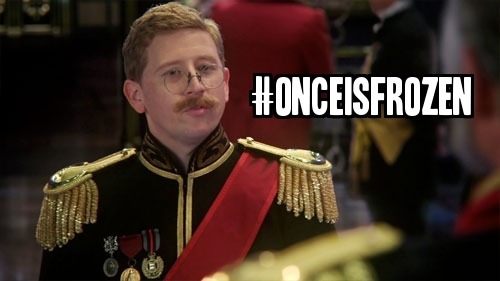 Charming: The Snow Queen has Emma trapped in the Sheriff’s office. Belle: I told them you would help, please. Rumple: SIGH. How can I refuse my beautiful wife begging for my help? Hook: I know you’re up to something. Rumple: Really? What was your first clue? When I admitted to lying to my wife and tricked you into helping me disappear an old man with a hat? Do you think you’re actually at all threatening? Because you’re not. Hook: No, really, I have my eye on you. Anyway, Ingrid pushes Emma so over the edge that Emma accidentally blasts a hole in the wall of the sheriff’s department. Ingrid disapparates as the brain trust rush over to make sure Emma is okay. But she’s not. She tells them all to back off so of course they all rush her. Pow, bam, boom, Emma blasts a lamppost and it lands on Charming when he heroically pushes Hook out of the way. Snow yells furiously at Emma and Emma runs away. Okay, let’s unpack this a little. First, rather than run in to save Emma the way the others do, Rumple hangs back excited (for him) to see her flinging around such power. I don’t trust Rumple for one second and I think there were many wheels turning in that moment. Second, as much as I won’t forgive Hook for continuing to lie to Emma, he is devoted to her, and I do love that he puts his life in danger for her and then Charming puts his life in danger for Hook (and by extension, Emma). It’s a tiny moment but it’s good storytelling. Unlike, third, Snow’s outburst. Snow’s distrust of her daughter’s magic is too sudden. She grew up with magic AND with chaos. Many lampposts have fallen in Storybrooke and certainly Charming’s life has been in danger many times and many of those times way more danger than this time. And the line reading did not relay fear, but anger. Fear makes sense but anger? Maybe in that moment Emma reminds her of Regina? Maybe it’s just the lack of sleep and control, like when she lashed out at Granny and the dwarves in the electrical plant? Maybe it’s because Snow only has half a heart and maybe her half is the half with the black dot? Thing is, I don’t want to be trying to figure this out, but I also can’t accept it on face value. Because it doesn’t make sense for Snow. Emma drives away and hides and they all agree it means she doesn’t want to be found. And Snow says it’s on them, but I say it’s on her. Hook and Henry ignored the danger and ran towards Emma. Charming ran toward Emma and pushed Hook out of danger. 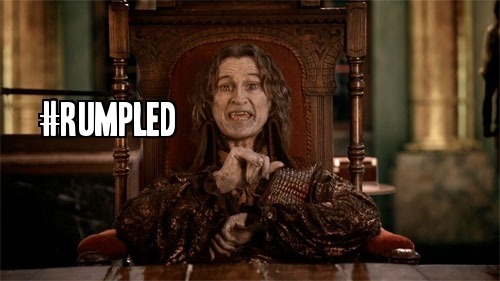 Rumple is Rumple. 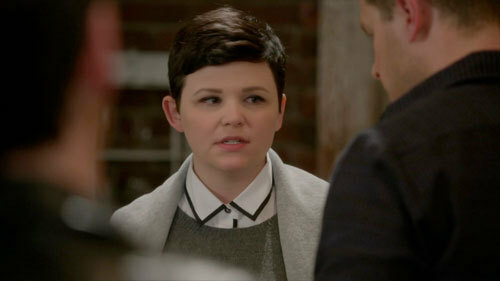 Elsa didn’t yell at her, Belle didn’t yell at her, the only person who yelled at her was Mary Margaret. So try to be a little bit more introspective, Snow, mmkay? 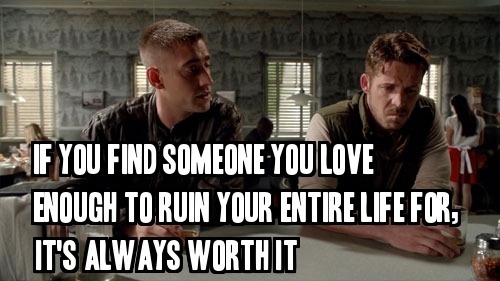 Now let’s look at Robin and Regina. If you ship it, I’m happy for you. Maybe skip this part. It makes me so angry. Not that they are together, but the way in which they are being presented. In act one we get Robin coming down into Regina’s space, uninvited, and making her so uncomfortable that she literally backs away into a corner. The biggest problem with this bit is that it happens in the same episode as Ingrid’s sexual assault and the direction is too similar for comfort. Especially given this series loves parallels, and Ingrid and Regina have the same type of prominent mirror. I do blame the script and direction for the undercurrent of danger in this scene but it’s still an issue. The visual of Regina backing away is powerful and creepy. In act two we get a conversation between Robin and Will Scarlet. Robin is annoyed that Will screwed him over in Sherwood and almost got them all killed. Will accepts his annoyance but he did it for love and he wouldn’t do anything differently…which brings us to the heart of the matter. Will and Robin start to talk about love, lost and found. I wish I cared as much about Robin & Marian and Robin & Regina as I do Will & Anastasia but I don’t. This makes my heart burst and break at the same exact time. And I guess Robin had the same reaction? Because he does finally act. He leaves his drinking buddy and heads back to Regina and this time when he declares his undying love he follows it up with a kiss and I know, I know!, we are meant to find this romantic and tragic and beautiful and all that and I swear I would like to but he leads with “I’ve always tried to be a really good person” and ends with “I love you so much I don’t want to anymore”…. Really? They are SO Snow and Charming in first season and I still hate it SO MUCH. I can’t wait til they come out of the secret love lair to Granny, Roland in arms, with the news that Marian has taken a turn for the worse and Robin has to come now if he ever wants to see her again and then he tells Regina he’s sorry and she says ‘no, wait, I can help’ and Granny says ‘you’ve done enough!’ and the whole town turn their backs on Regina and cry ‘harlot’ not really under their breath despite her spending the entire last week trying to counteract the spell. I super can’t wait for that scene. Aside: can someone please just get the kid to kiss his mom so we can be done with the true love’s kiss antifreeze problem? Obvious solution is obvious. Look I hope I am very, very wrong about where Robin and Regina are headed but I am not holding my breath. Finally, Rumple and Ingrid have another one of their whispered conversations laced with rage and subtlety. Ingrid’s ready to make a deal for her magic yellow ribbons of sisterhood and give Rumple the answer he needs to become the most powerful wizard ever (again). 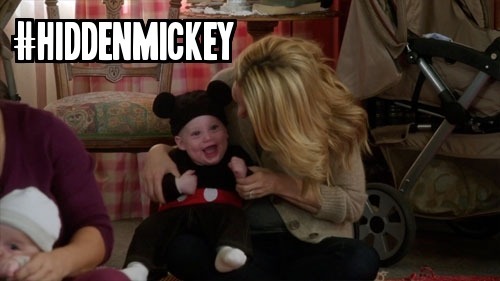 He can have the whole universe as long as she can keep Storybrooke as her New Arendelle. I feel safe, how about you?